His RAF Records in 1922 show he was 5ft 6 in tall, chest 32.5 inches, brown hair, blue eyes and a fresh complexion. Above: photo of Harry Slade, probably sometime during 1917. From looking at his units� regimental history website www.queensroyalsurreys.org.uk it is likely that Harry was in the 2/4th battalion of the Royal West Surreys. This unit was sent to Egypt and Palestine in late 1916 and formed part of General Allenbys� army (this battalion was part of the 53rd Division). This army marched through the desert and fought Turkish troops at Gaza 3 times during 1917, finally breaking through in November. The 53rd division fought some tough battles well into the desert, taking part in the Battle of Beersheba and fighting up along the road through Bethlehem, entering Jerusalem in December 1917. Some heavy fighting followed as shown by the numbers of West Surreys buried in Jerusalem War Cemetery. Jericho was also captured in the New Year and the Turks retreated to the River Jordan. Diaries from the time reveal that most units suffered from lack of food, water, and some intense sandstorms. Many troops became malnourished and exhausted, leading to much sickness. The 2/4th battalion then spent around 3 months operating in the area before being moved back to Alexandria, Egypt, from where they sailed to Italy on June 16th 1918. They arrived back on the Western Front on 29th June and became part of the 101 Infantry Brigade (34th Division) at Proven, Flanders. They had travelled from one front directly to another in a very fast time, with no return home. The Germans had launched a large offensive that threatened to break the lines on the Western Front during spring and summer 1918. This is probably the reason why the battalion were rushed to France so relatively quickly. Once there they fought right through to the end of the war and the intensity of this period can be told by the numbers of casualties during the four and a half months up to the end of the war. In Flanders the Battalion lost 15 officers, 433 men killed, wounded and missing. Bear in mind that a Battalion was about 1000 strong then the casualty rate was extraordinary. Between 28th July and 2nd August they took part in the Battle of Soissons, a part of the 2nd Battle of the Marne, in which fresh American troops also took part. During August they fought further north at Ypres and Scherpenberg. They crossed the Lys river and entered Lauwe, Belgium on 18th October. The forward push that forced an end to the war was in full swing and during the last few weeks they pursued the German army across to the Scheldt river. As part of this piece I have included some military maps showing the areas in which the 2/4th btn operated during 1917 and 1918. Despite the losses in 1918, perhaps Harry should be considered to have been �lucky� to go to the Holy Land first if you consider the fate of other Battalions in 1917. His regiments� 3/4th battalion, who were sent to France instead in 1917, lost nearly half its strength in its first few days in the trenches , during the 3rd Battle of Ypres in October 1917. Arrived in Egypt September 1917, fought the Turks in Palestine. Then marched into the desert where received a wound from shrapnel. Reached Jerusalem where he saw T.E Lawrence (of Arabia).Then marched from Jerusalem to Jericho. Returned to Alexandria in mid 1918 and ferried by boat across to Italy. It took 8 days ride in a cattle truck to reach Belgium. On to France and fought in the trenches from late June 1918, before becoming ill with trench fever. Given the timescales given it is likely he became ill during late September or early October 1918. Sent firstly to a casualty station, then spent 6 weeks in an army hospital in Wimereux (nr.Boulogne & Arras). Note: records show there were several large army hospitals in the town of Wimereux at this time and the large military graveyard there today pays testimony to this. 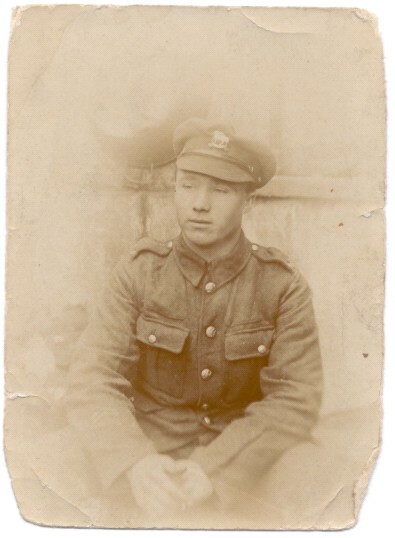 At the end of this time, with the war finally reaching a conclusion, Harry was evacuated back to England (Dover) from Boulogne aboard the SS Cumbria sometime during the autumn of 1918. Following this Harry was sent to Stockport and Manchester before another spell of sick leave and then onto Sittingbourne where he caught Spanish Flu and was hospitalised for another month. In one of those strange coincidences he was sent to convalesce in Buckingham Park camp, Shoreham, just a few miles from where he would later settle and raise his family. 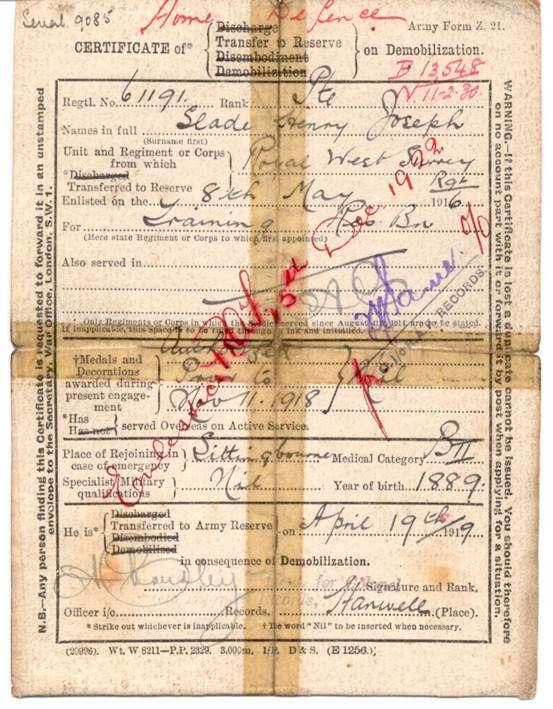 Harry was demobbed by the Army in April 1919. His demob card is shown below.